JASSA SINGH RAMGARHIA (1723-1803), founder of the Ramgarhia chief ship and one of the prominent military leaders of the Sikhs in the second half of the eighteenth century, was born in 1723 at Tchogill, a village 20 km cast of Lahore. His grandfather, Hardas Singh (d. 1716) had received pdhul, the vows of the Khalsa, at the hands of Guru Gobind Singh and had fought in the campaigns of Banda Singh Bahadur. His father, Bhagvan Singh was killed in a fight against Nadir Shah during his invasion of India in 1739. Young Jassa Singh then joined the jathd of Nand Singh Sarighania and learnt the art of warfare at an early age. In 1745, he was deputed to settle terms with Adina Beg, the faujddr of the Jalandhar Doab, who was harassing the Sikhs under instructions from Nawab Zakariya Khan, the Mughal governor of Lahore. The wy faujddr, Adina Beg, prevailed upon Jassa Singh to accept office under him, with a minor command of a regiment consisting of 100 Sikhs and 60 Hindus. The Sikhs were greatly annoyed at the conduct of their envoy, but Jassa Singh did not remain with Adina Beg for long. When in October 1748, the Sikhs gathered at Amritsar to celebrate the festival of Divali, Mir Mannu, the new provincial governor, marched upon the city to expel the Sikhs. The Sikhs disappeared into the neighbouring jungle, but 500 of them took shelter within their newly built fortress, Ram RaunT, and defied the Mughal force. The mudfortress was besieged and skirmishes continued for four months in which two hundred Sikhs lost their lives. The survivors requested Jassa Singh to come to their rescue. Jassa Singh left Adina Beg, and made an appeal to Kaura Mall, the Diwan of Lahore and a Sahajdhari Sikh, to save the Sikhs from destruction. At the Diwan`s intercession, Mir Mannu raised the siege, though the fortress of Ram RaunT was completely destroyed. Mir Mannu`s death in November 1753 plunged the Punjab into anarchy. The Sikhs again emerged into the open and decided to rebuild the Ram RaunT fort. Jassa Singh was assigned to this task and he, with the help of his contingent, reconstructed the fortress and named it Ramgarh. Since then Jassa Singh, earlier known as TchogillTa after the name of his village, or ihokd (carpenter, the caste he came from) began to be called Ramgarhia in appreciation of the work done by him. In April 1758, AdTna Beg became governor of the Punjab. He sent a strong force under MTr `AzTz BakhshT to clear the forests in which Sikhs had taken shelter. A large number of them including Jassa Singh Ramgarhia, Jai Singh Kanhaiya and Amar Singh Kirigra, fled to Amritsar and took shelter in the fortress. Ramgarh was besieged. Jassa Singh and Jai Singh made numerous sallies killing a large number of the besiegers, but were ultimately forced to evacuate. After Adina Beg`s death in September 1758, the roving bands of the Sikhs returned. Jassa Singh Ramgarhia and Jai Singh Kanhaiya united and within a short time they seized large slices of territory in four out of the five Doabs; they occupied the fertile tract called Riarki to the north of Amriisar embracing the district of Gurdaspur. Within a decade Jassa Singh became one of the leading fig J^Ol ures of the Dal Khalsa. In 1770, he led plundering expeditions into the hills. The local rajas sought safety in submission and Jassa Singh collected a tribute of 2,00,000 rupees from the Karigra states. He built a fort at Talvara on the left bank of the Beas and stationed his brother, Mali Singh, with 4,000 horse, in the fort. Jassa Singh Ramgarhia along with other Sikh sarddrs, fought many a pitched battle against the Afghan invader, Ahmad Shah Durrani. As the Afghan threat receded, the Sikh sarddrs began fighting among themselves. The Ramgarhia Kanhaiya cleavage over their adjoining territories in the districts of Gurdaspur and Hoshiarpur widened. In the battle of Dinanagar in 1775, Jassa Singh Ramgarhia joined the Bharigi sarddrs against the forces of the Kanhaiyas and the Sukkarchakkias. Soon a rift appeared between Jassa Singh Ramgarhia and Jassa Singh Ahluvalia when the latter wrested Zahura, a Ramgarhia territory, and conferred it upon Baghcl Singh Karorsirighia. Jassa Singh Ramgarhia andJassa Singh Ahluvalia became sworn enemies of each other. Jai Singh Kanhaiya joined Jassa Singh Ahluvalia and the Ramgarhia Sardar had to flee the Punjab. Driven out of the Punjab, Jassa Singh became a soldier of fortune. He took possession of Hissar and raised a large body of irregular horse, his depredations extending to the gates of Delhi and its suburbs and into the Gangetic Doab. Jassa Singh and other Sikh chiefs conquered Delhi and entered the Red Fort. 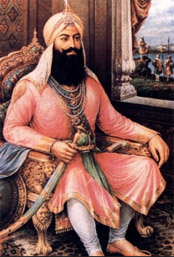 Jassa Singh Ahluvalia ascended the throne on 11 March 1783, but Jassa Singh Ramgarhia challenged his right to do so at which the Ahluvalia chief vacated the royal seat. Jassa Singh Ramgarhia then invaded Meerut and levied an annual tribute of 10,000 rupees on the Nawab. Soon a body of 30,000 horse and foot under him and Karam Singh crossed into Saharanpur district, ravaging it freely. After the death of Jassa Singh Ahluvalia in October 1783, there were further fissures in the Dal Khalsa. Jai Singh Kanhaiya and Mahari Singh Sukkarchakkia fell out. Mahari Singh won over to his side Raja Sarisar Chand of Karigra and invited Jassa Singh Ramgarhia to come back to the Punjab and make a bid to recover his lost possessions.